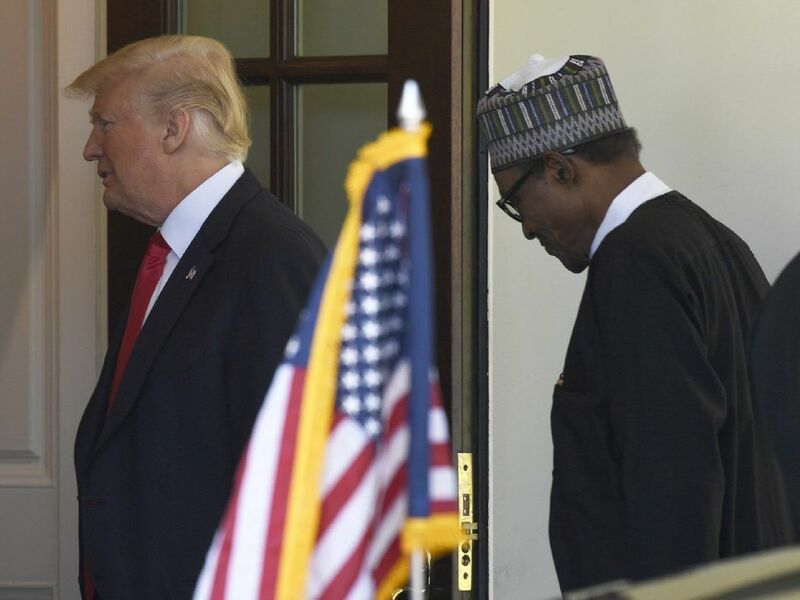 President Donald Trump, left, welcomes Nigerian President Muhammadu Buhari, right, to the West Wing of the White House in Washington, Monday, April 30, 2018. In fact, Trump seemed to double down on his view that some countries in Africa are "very tough places to live in." "We didn't discuss it," Trump said at a joint news conference in response to a question first put to Buhari. The Nigerian leader was asked whether he had talked to Trump about reports that the U.S. president used the word "shithole" to describe African countries in January. Buhari skirted the issue, saying he was unsure about "the validity or whether that allegation against the president was true or not." "So the best thing for me is to keep quiet," Buhari said. In a meeting with a group of senators on Jan. 11, Trump questioned why the U.S. would accept more immigrants from Haiti and "shithole countries" in Africa as he rejected a bipartisan immigration deal, according to one participant and people briefed on the remarkable Oval Office conversation. He said he instead would prefer immigrants from countries like predominantly white Norway. Later Monday, former White House aide Omarosa Manigault Newman tweeted to Buhari: "FYI he said it." Manigault Newman resigned in December, but her departure wasn't effective until Jan. 20. Buhari is the first African leader to come to the White House since Trump took office. Nigeria, Africa's most-populous country with nearly 200 million people, is the continent's largest economy and its leading crude oil exporter. "We will be investing substantially in Nigeria if they can create that level playing field that we have to, very much, ask for and maybe demand," Trump said. Buhari did not directly respond to Trump's call for the removal of trade barriers. Trump said during a joint appearance with Buhari in the Oval Office earlier Monday that terrorism was the other big issue on the agenda. The extremist group Boko Haram launched a violent insurgency in northeast Nigeria nine years ago with the goal of creating an Islamic state. Tens of thousands of people have been killed while mass abductions of schoolgirls brought the group international notoriety. Trump called Boko Haram a "terrible problem" and said the Islamic State group has been "very much decimated." Associated Press writer Sam Olukoya in Lagos, Nigeria, contributed to this report. This story has been corrected to show that Trump is alleged to have said the vulgar term in January, not last year, and that Nigeria is Africa's most-populous country, not its second-most populous.